Hey there, welcome to the day one of the May Neat and Tangled release. The next stamp set up is called Complementary Colors. It's a cute little stamp set that's perfect for creating whimsical cards. This card was created with a wash of background color in blue and orange using Peerless Watercolors. The cute little painter icons were colored with Distress Inks and popped up on foam tape. 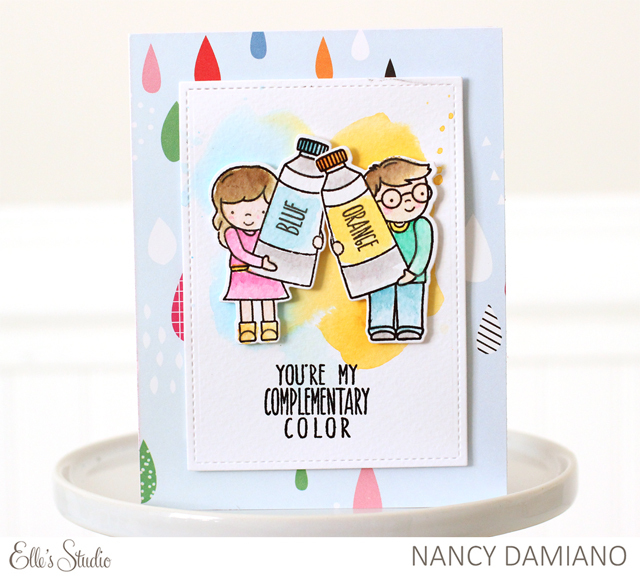 Placing the card on a patterned paper gives the card a punch of color! beautiful background with the adorable images ! Awww!!! What adorable card!!! Those guys are too cute! Beautiful colouring!!! Cute card using this adorable new set. Love the drips of color in the background. Such a fun and happy card! Love the artist feel, perfect compliment to these little painters. Darling card and stamp set. Thanks for sharing your creativity. Your kids are so cute. I like the paint background, too! So sweet! I like that you popped the panel up on patterned paper. It really adds to the color theme. This really is a darling card !! Sweet card! Love your pretty coloring! so cute. I like the matching colors behind the boy and girl. What a cute little pair! Love your coloring and that paper you chose for the base!